It is my honor to showcase one of the WSTA’s longtime and devoted members, Dalton Trucking. Over the 75 years of this association’s existence many of our members have been recognized with various awards. These awards have covered many areas of the transportation industry from safety to innovative business practices, and charitable activities. 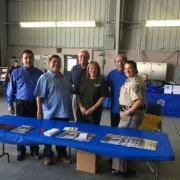 Since I was busy in Fresno on the weekend of the Truckin’ for KIDS event, Art Soto and Victor Vasquez (San Gabriel Valley chapter chair) volunteered to work the WSTA booth at the September 27th event. We are so very grateful for all of members/friends support and participation. I will be coming to your location soon. 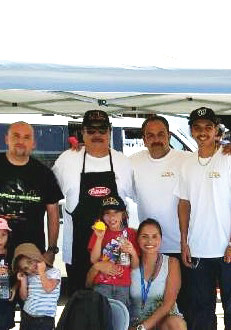 (Image above) Art Soto pictured with Peterbilt apron in center and Victor Vasquez on the right with Victor Jr. and Art Soto’s family members. Pictured left to right: Rudy Navarrete and Ryan Vazquez of EERS. 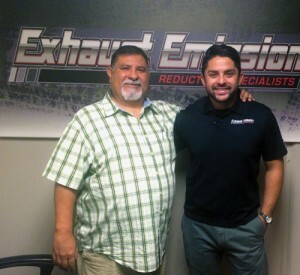 While I visited affiliate member Exhaust Emission Reduction Specialist (EERS) representative Ryan Vazquez in Corona, which is right in my backyard, it came to mind that I don’t need to travel too far to connect and engage with our members. Not only has EERS been a valued affiliate member for several years, but Ryan has been very informative of our member’s CARB compliance needs and humbly quiet with his generous support for our scholarship awards program. We were able to raise almost $5,000 at this year’s Scholarship BBQ Fund Raiser at Superior Trailers Works in Fontana, California. We were contacted by a representative for the Tochigi Trucking Association in April of this year. They found us while searching for an established trucking association here in the U.S. After several months and multiple emails, we coordinated a visit to the association headquarters from the Japanese delegation. Sandra Medina, Customer Service Manager for AADT with Rudy Navarrete, Regional Sales Director for AADT. Both me and Sandra Medina, Customer Service Manager, American Alliance Drug Testing attended the American Towman ShowPlace in Las Vegas on Friday, May 15th and Saturday, May 16th at the South Point Hotel and Convention Center. The nature of these types of trade shows is always about getting our name out there – AADT. We are always hopeful of generating new business with our presence while working the booth for two long days. Although we don’t always see immediate results, we do get our share of new applications as an outcome of these shows.